One of the greatest pleasures of cinema is discovering something new. A cult film at the bottom of a discount bin. A restored print of a foreign classic previously thought lost. Perhaps it's simply stumbling onto a new personal favorite film while perusing the endless wares of digital streaming. Beyond these treasured delights exists a different experience: Discovering a film that is both visually and tonally remarkable but is also esoteric; filled with dangerous ideas and profane secrets. John Hyams' fourth entry into the Universal Soldier franchise, Day of Reckoning is one of these ethereal entities. A terrifying refutation of cinematic violence and masculine archetypes, Reckoning is a neo-noir horror hybrid that exists underneath a labyrinthine prison of throwaway action films. Featuring surreal, back alley visuals, uncharacteristically shocking sequences of violence, and a subversive undercurrent, Hyams' masterpiece is a road trip into the hell of a faceless America, a wasteland of recycled ideas and shattered dreams. 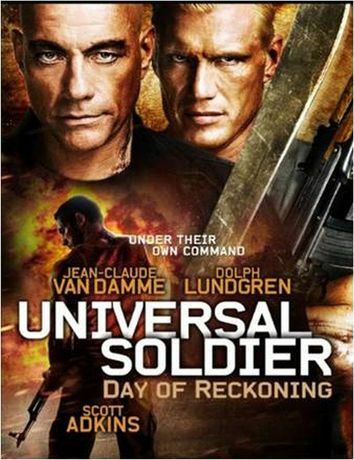 John's family is murdered during a home invasion by a group of soldiers led by universal soldier (Unisol) Luc Deveraux. His quest for revenge sends John on a nightmarish excursion into a world where memories and reality are weaponized concepts and violence is a lens through which these constructs are mercilessly perceived. Yes, this was essentially a direct to DVD film in a franchise that no one asked for. Hyams' previous entry, Universal Soldier: Regeneration was a more traditional approach, yet it also showcased Hyams' originality with a stunning finale. Reckoning is a complete departure, whose relation to the other films is tangential at best. Scott Adkins’ performance as John delves beyond expectations, plumbing the purposefully shallow depths of psychological devastation throughout Hyams' grotesque wonderland. While Jean-Claude Van Damme and Dolph Lundgren's performances are essentially cameos, each of them delivers some of the best performances of their careers, presenting the possibilities of their now pigeonholed talents. This is one of the many, many accusations nestled within Reckoning’s tainted DNA. Two of the most iconic, muscle bound action stars of the '80s deliver two outstanding performances in a one of a kind film that no one will see. It is as if Hyams' coaxed these remarkable turns out of each of the legends to cement his venomous creed. 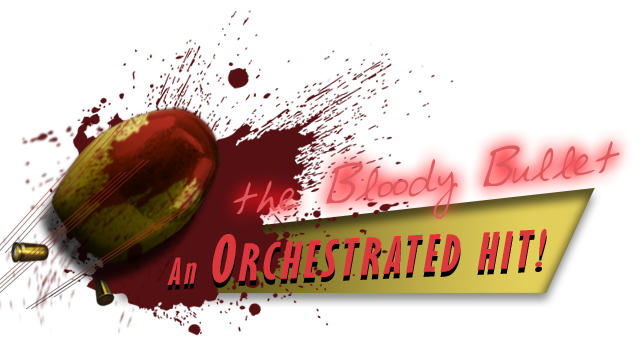 Audiences crave hyper-kinetic violence, doled out upon endless scores of nameless minions, usually by an alpha male protagonist, however, Hyams' symphony of carnage relegates the "heroes" to the shadows. Lundgren's formerly villainous Andrew Scott emerges several times throughout spewing apocalyptic rhetoric in which personal agency and spiritual freedom are the brimstone of choice. 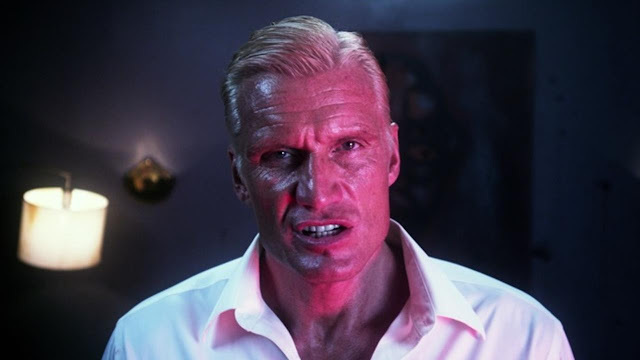 Van Damme's Deveraux is a ghost, the end of John's odyssey through the heart of a genre that is revered by a fractured nation whose culture of violence may ultimately undo it, and Hyams' choice to present Deveraux as a Colonel Kurtz clone only reinforces this truth. Yaron Levy's acidic cinematography frames each sequence as a self-contained nightmare, applying a variety of techniques that wraps the entire ordeal in the skin of a horror film. The colors are toxic, bathing everything in a grimy veneer akin to a cloud of meth. Each fight sequence is a living organism, macabre apparitions that are masterfully choreographed by Larnell Stovall. There are consequences to each encounter, with every bullet wound, broken bone, and shattered torso arriving with visceral impact. The sound design is sickening, further distancing Reckoning from its origins with every gunshot. Neon lighting and dingy sets are the final ingredients in Hyams’ potent incantation, the yield of which is a vortex that aims to not only deconstruct the traditional action film, it seeks to exorcise it from the viewer’s mind. The nameless, perhaps even soulless Unisols who are summarily executed are at odds with their creators, a sly reflection of symbiotic, perhaps poisonous, relationship between studios, audiences, and box office numbers. As franchises rise, climbing financial records charts on the freshly picked bones of their predecessors, the cyclical immortality of the blockbuster is realized in this quiet anathema of a film. Available now on Blu-ray, with the unrated director's cut available on a Canadian, Region 1 disc, Universal Soldier: Day of Reckoning is an action film like no other. While comparisons to Anderson's creative crusade in the Resident Evil films could be made, Hyams' opus chooses to mine the disturbing back channels of the mythology behind those who create visual art and those who hungrily consume it. This is a revelation on that process, in which the viewer it treated to the tendons and organs that exist underneath the dermis of billion-dollar explosions and costumed extravaganzas; and at Hyams’ beautifully grim table, there is a feast unlike no other awaiting those who dare to sit.